Bail Bonds Oahu: Do Your Surroundings Cause You Stress? At Wanna Get Out Bail Bonds on Oahu, our goal is to provide each and every one of our clients with the information they need to make the right decision for their specific situation. In other words, whatever is best for you is exactly what we want. We’ll work hard to help ensure that regardless of your situation, you get the help you need. In many of our posts, we discuss how bail bonds work, what you can expect when you call us, how long it takes to get released, and other similar subjects. But what about if you’re already out on bail? That’s something that not a lot of people are talking about, and frankly, it’s a situation that many people are in. So what’s the average person supposed to do until he or she needs to be back in court for a trial? The truth is that sometimes the best thing you can do is to seek rest and relaxation, but that can be trickier than it would at first seem. For starters, it’s important to consider your surroundings. Are they stressing you out or are they bringing you peace and calm? In today’s post, we’ll be sharing a few tips for how you can quickly improve your surroundings to help you kick your stress to the curb. Keep reading to learn more. With spring just around the corner, why not get a head start on cleaning your living space? 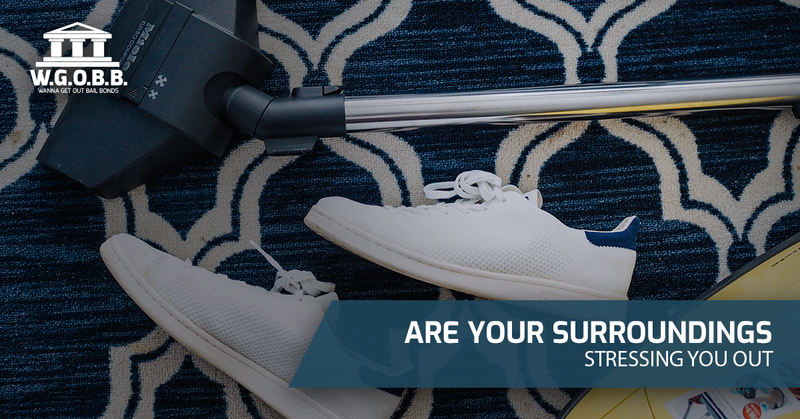 It’s amazing what sweeping the floors, picking up the clutter, and vacuuming the carpets can do. The weather here in Honolulu has been wonderful lately — but let’s be honest, that’s pretty much always true — so open up a few windows to let in some light, start cleaning, and before you know it, you’ll feel much more comfortable. This is a great opportunity to get rid of things you don’t want in your home anymore. There’s absolutely nothing better than a fresh start, and with clean surroundings, you’re sure to have a clear mind. “How is a plant going to make my house better?” That’s a good question, but you’ll have to trust us when we say that it’s one of those things where if you don’t have any plants in your home, you don’t know what kind of difference it actually makes. Having a plant (or plants) in your house can make all the difference in the world because they just help to make a space feel more cozy, which is perfect if you’re feeling stressed out. Did you know that color can subconsciously have a big effect on your mood? It’s true! Science has shown on many different occasions that color can inspire a number of different feelings. For example, reds, oranges, and yellows can inspire creativity, but they can also foster stress and discomfort. On the other hand, purples, greens, and blues can promote calm and tranquility. Now we’re not saying that you should go out and repaint every room in your house. Instead, simply think about how you can add calming colors to your living space. It can be as simple as a new piece of art (keep in mind that you can create your own art if you’re looking for a relaxing hobby), a couple of blankets, or even some knick knacks that you place on your coffee table. As we mentioned, greens can be calming, so if you take our advice and add a plant to your living space, it’s doing double duty. It doesn’t get much better than that! At the end of the day, the way you choose to find relaxation is up to you. There’s nothing pleasant about dealing with stress when you’re preparing for your upcoming trial and the thing we want our readers to take away from today’s post is that a little bit of effort can go a long way towards helping you to feel calm serenity instead of frustrating stress. Perhaps you’re in a situation where you’re feeling stress right now because you just got a phone call that you’re loved one has been arrested. It can be easy to panic, but the best thing you can do is to remain calm and give us a call. At Wanna Get Out Bail Bonds, our goal is to provide each of our clients with personalized care to help make life a little bit easier. We know that what you’re going through is incredibly difficult and it can be tough to figure out what to do and who to call. We’re here to help. No matter the time of day or night, no matter the situation, we’ll be there to offer free bond advice, ensuring that you always know the path forward. Our team prides itself on offering fast, friendly assistance and affordable bail bonds. Regardless of what you’re up against, we’ll be there to lend a helping hand. Contact us today to get the help you need. We look forward to hearing from you!